When it comes to competition BBQ, I have always been somewhat of a purist. I say, "somewhat" because I do inject my pork butts and brisket, and I am a firm believer in leveraging "the Texas crutch" (foil). We competitors are constantly striving to achieve that perfect bite (or maybe two) that will wow the judges, and you have to use chemistry to your advantage. In my mind there are two kinds of chemistry -- natural and enhanced. The natural uses preparation and cooking techniques that make use of what is already in the meat to help it the be best it can be. The enhanced end of the spectrum adds a concoction of additives (typically containing sodium tripolyphosphate and calcium lactate) that help enhance the natural flavor and retain moisture. Many of the top competition teams use these types of commercial injections to gain an advantage. Until now, I had never tried any of the commercial injections, but I've been admittedly curious to see what all the hullabaloo is about. I've heard about the great beef flavor and juices pouring out of an otherwise monotonous brisket. All this, combined with the results of the aforementioned top teams, certainly made me wonder if I was missing something. 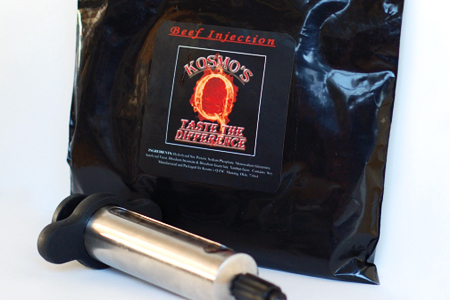 I decided that it was time to see what all this buzz is about, so I contacted Kosmo of Kosmo's Q and he kindly sent samples of his beef and pork injections for me to try. I started with an 11.3 pound select-grade brisket. I wanted to keep the playing field level, so I trimmed it like I normally do, and I injected it per the instructions, using beef consomme as the mixing liquid. The powder mixed very easily without clumping, and I injected all but about 1/4 cup of the mixture. Aside from the new injection formula, this was a standard brisket prep for me. I then cooked the brisket using my standard hot & fast technique. Again, I wanted to keep the injection as the only variable in my standard procedure. I must say that I was impressed with the results. While I didn't see much difference in the moisture content, the beefy flavor was definitely enhanced, but not unnaturally so. There were no off flavors or other noticeable changes in the overall flavor profile, as compared to my standard competition brisket. It was just a "kicked-up" version of what I normally cook. Kosmo's is a serious winner in beefy flavor enhancement. Now that I know what all this phosphate injection madness is all about, I don't know that I would use it in competition. Why? Well, it contains MSG and, while I don't necessarily have a problem with it, I am very leery about using MSG in situations where I don't know who will be eating it. I prefer to keep things natural in these situations. 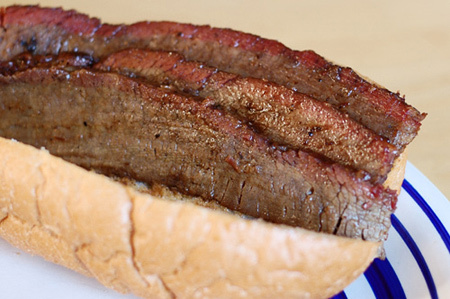 In conclusion, Kosmo's Q is a great product for those that are looking to take their brisket to a new level. It offers outstanding flavor enhancement without compromising your flavor profile.